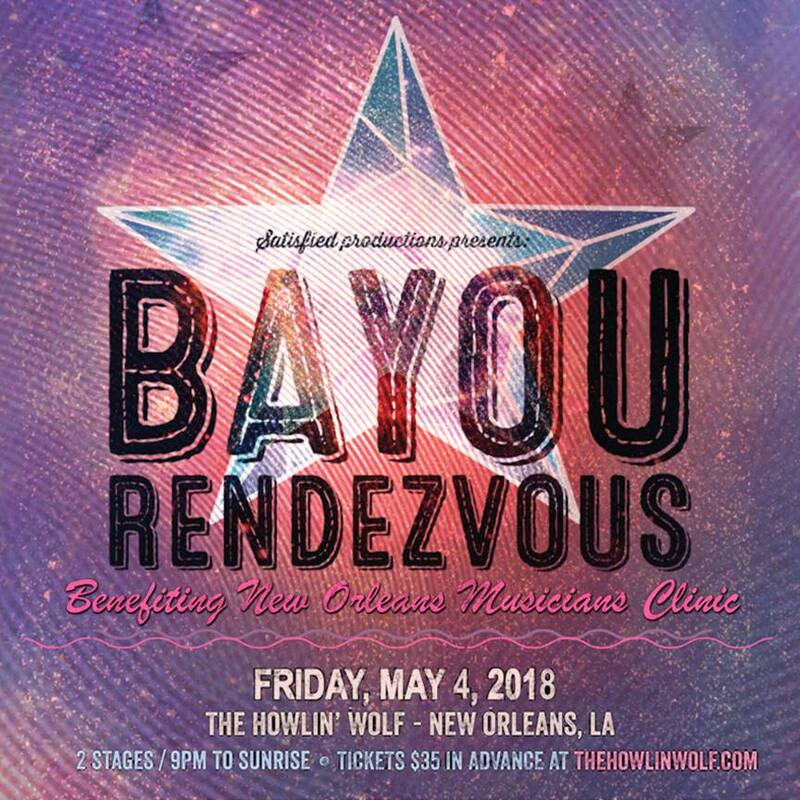 Satisfied Productions presents: The 16th Annual Bayou Rendezvous benefiting the New Orleans Musicians Clinic. 10 Bands on 2 Stages going all night long, featuring:Dr. Klaw, Eric Krasno (Lettuce/Souive), Adam Deitch (Lettuce/Pretty Lights/Break Science), Nigel Hall (Lettuce), Nick Daniels (Dumpstaphunk) and Ian Neville (Dumpstaphunk),The New Orleans All-Stars, George Porter Jr., Stanton Moore, Ivan Neville, Johnny Vidacovich & TBA with Special Guests 300 Years! A Funky Retrospective celebrating New Orleans .Tricentennial,featuring New Orleans Suspects with TBA, The Bonerama horns & special guests, Polyrhythmics, performing a special set documenting the history of the Deep Funk Revival w/ special guests, plus original music. Southern Avenue, fiery Stax recording artist from Memphis,The Revivalists and Naughty Professor side project featuring Bill Daniel (Naughty Professor), George Gekas (Revivalists), Rob Ingraham (Revivalists), Sam Shahin (Naughty Professor) Butcher Brown . Fresh new funk fusion Jazz from Richmond, VA, Ideateam, 9 piece powerhouse funk ensemble from Sacramento, CA,Sunrise Breakfast. Jam with The NorCal All-Stars featuring Brooker D. and the MFs w/ special guests, Eric McFadden (P-Funk, Anders, etc. ), Chris Rossbach (Zigaboos guitarist), Schedule of Events : Main Stage:9:00PM 300 Years! The Bonerama Horns & Special Guests 11:30PM .Dr. Klaw. 1:30 AM The New Orleans All-Stars. 3:30 AM Polyrhythmics -Den Stage:.10:00 PM Butcher Brown .12:00 AM Southern Avenue . 2:00AM Space & Harmony . 4:00AM TBA .5:45 AM Ideateam . 7:00 AM Sunrise Breakfast Jam with The NorCal All-Stars.